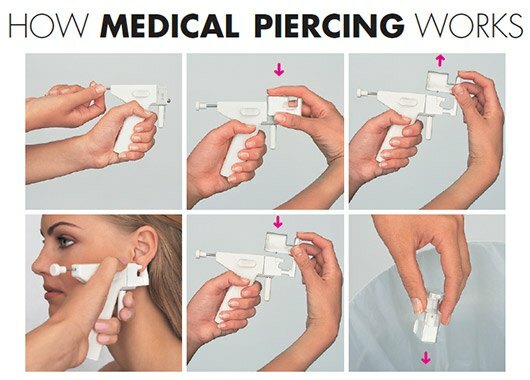 Our medical ear piercing is developed entirely upon what is known as "modern aseptic technique" within the health care industry. 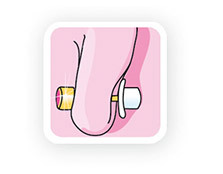 This means that all our products and methods are safely designed to avoid the spreading of infections during piercing. The sterile method guarantees that the piercing is hygienic and safe. The Blomdahl System is only available through medical professionals. This ensures the safest possible ear piercing experience. Looking for a medical professional in your area that offers our system? Are you a medical professional looking to offer Medical Ear Piercing? Our piercing earrings are developed in consultation with skin specialists and suitable for everyone, even if one already has an allergy. 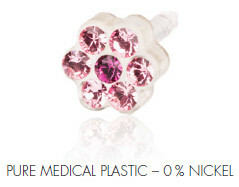 You can choose between piercing earrings made from carefully selected plastic or titanium of pure medical quality. The coating is applied only to the parts of the jewellery that do not come into direct contact with your skin. 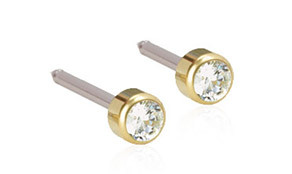 Blomdahl piercing earrings are not like ordinary earrings. They are specially designed to facilitate the healing and so that you can easily change to regular earrings after the healing period. When air can circulate around a new piercing, it will heal better. That is why the earring backs on Blomdahl piercing earrings are always fixed at the tip of the post, where they also encapsulate the tip. The earring backs cannot be moved like on regular earrings. That way the air can always circulate around the new piercing. In order for the new piercing to be kept airy and to heal better, it is important that the piercing earring has the right length. But all earlobes differ in thickness. For slightly thicker earlobes Blomdahl has developed piercing earrings with extra long posts. After the healing period, you can remove the piercing earrings and change to other earrings. However, the skin that has grown within the holes is still thin and delicate and can easily tear. It takes up to a year before the holes have healed completely. The holes have also a tendency to shrink. 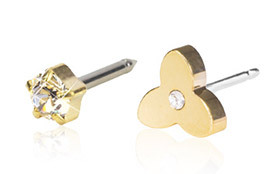 Blomdahl’s piercing earrings have been designed so that the holes will be slightly wider in the beginning and thereby not get so easily damaged when you change earrings. 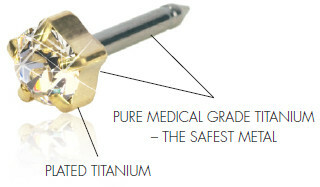 Medical Grade Titanium is the safest of all metals because it binds what little nickel there is extremely well. In other words, little or no nickel is released into the skin and underlying tissue. Titanium is accepted extremely well by the body and is therefore used more and more in implants and other medical applications, often replacing stainless (surgical) steel. Before having your ears pierced, you will have to attest that you have received our written aftercare instructions and that you accept the conditions stated within. I am of legal age. Parental/guardian consent is required if I am under legal age. I am/minor is in good health and do not have any ailments which makes it recommendable to refrain from ear piercing. After the ear piercing, the holes are my own/guardian's responsibility. A new piercing is the same as a small wound. Therefore it is important to take care of it correctly during the healing period, so it does not get infected. By following the aftercare instructions I minimize the risk of infection. Never touch your ears with unclean hands. Wash your newly pierced ears (on both sides) thoroughly twice a day. Do not remove the earrings when cleansing. When showering/washing your hair, use liquid soap and rinse thoroughly with clean running water. Dry with a Kleenex or Q-tip. 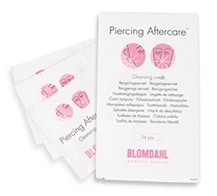 Supplementary cleansing is done with Blomdahl Piercing Aftercare cleansing swabs, which are gentle on the skin. The swabs make it possible to clean between your ears and the earrings/earring backs. Allow to air dry. Use a new cleansing swab for each ear, each time. Note! Do not clean with alcohol. Make sure that the area around the holes are kept clean, dry and airy at all times. Cover your ears when applying make up, hair spray, spray perfume, hair-dye, etc. Take extra care when you are putting on/pulling off clothing over your head, in order to prevent the earrings from getting caught. Bathing in a swimming pool, lake or sea: wait for as long as possible after the piercing and avoid keeping your head under water. When you come out of the water, cleanse with liquid soap or with Blomdahl Piercing Aftercare cleansing swabs – see point 2 above. 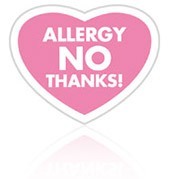 The risk for developing a contact allergy is at its greatest during the first year after ear piercing. This is why it is extra important to wear safe earrings during this time. In consultation with skin specialists, Blomdahl has developed skin friendly jewellery suitable for everybody and especially for those who have just pierced their ears. IMPORTANT! Redness and/or swelling and/or pain and/or rashes are indicative of a possible infection. If the hole is placed in the soft part of the ear (ear lobe), remove the earring and cleanse/disinfect. If there is no improvement the following day, contact your doctor. If the hole is placed in the cartilage part of the ear, remove the earring, cleanse/disinfect and seek immediate medical attention.